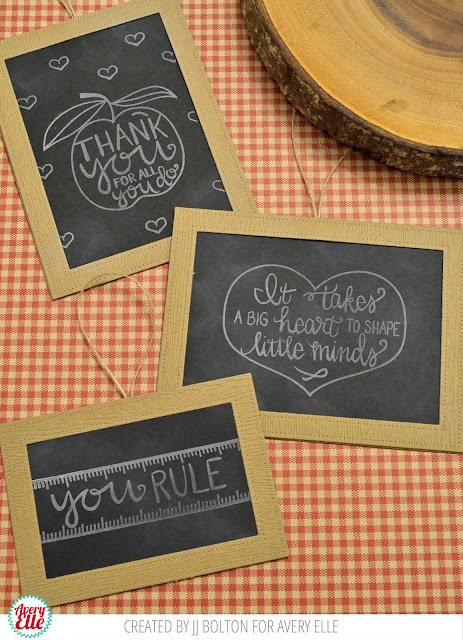 Today, I've a got a quick and easy project for teacher chalkboard tags! This was so easy, I was able to knock out a few of these tags in just 15 minutes! I used the Avery Elle teacher set called Little Minds. The chalkboard frame was made using woodgrain paper die cut with Double Pierced Rectangles dies. The best part of the rectangle dies is that I could cut a frame for the front and a full panel for the back. I added a little twine loop just to make it easy to attach to a gift. I think I need to check my spam folder! LOVE these chalkboard designs, JJ! I love the white sentiments on black, and the double pierced rectangles are perfect for your design, too! Awesome cards, as always!